When Gene Roddenberry's computer died, it took with it the only method of accessing some 200 floppy disks of his unpublished work. Here's how this tech mystery was solved. Call the engine room and get Scotty to the bridge: When the long-lost words of Star Trek creator Gene Roddenberry were found on 5.25-inch floppies—yes, floppy disks—it would take a Starfleet-level engineering effort to recover them. Roddenberry, who died in 1991, apparently left behind a couple of shoebox-sized containers of those big floppy disks. The problem? As any techie knows, floppy drives went out off fashion around the turn of the 21st century. Even if you bought a used 5.25-inch floppy drive off of Cyrano Jones on space station K7, you wouldn't be able to read the files on a modern computer, let alone plug in the drive. 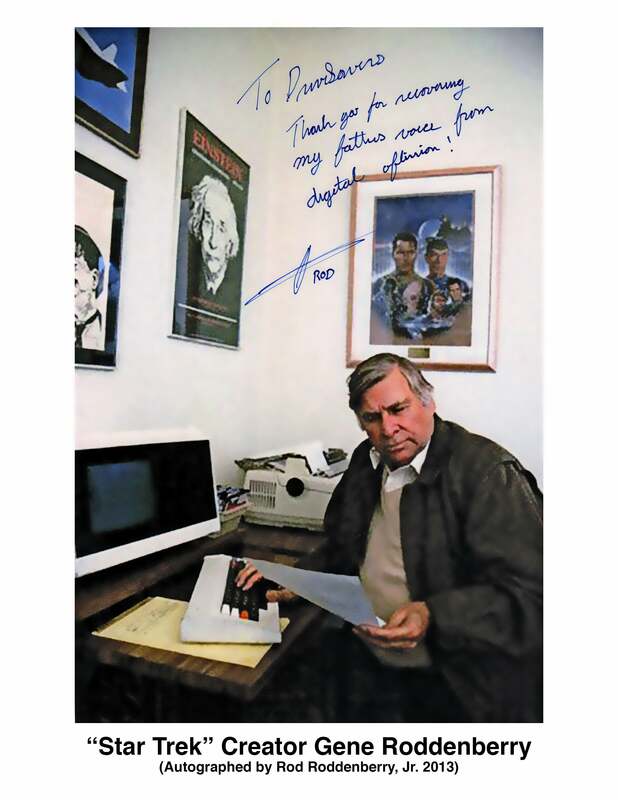 Roddenberry's estate knew of two possible computers the author had used to write those final words. One had been sold off in a charity auction and the second wouldn't boot when plugged in. Most of Gene Roddenberry's lost work was stored on the 1970s and 1980s era 5.25-inch disk, which here is flanked by the older 8-inch and newer 3.5-inch versions. Rather than accept that no-win scenario, Roddenberry's estate turned to DriveSavers Data Recovery. The lack of an operative computer was less than ideal, but Mike Cobb, director of engineering of DriveSavers, was optimistic, considering the company's ability to recover data from most forms of computer media known today. According to Cobb, the majority of the disks were 1980s-era 5.25-inch double-density disks capable of storing a whopping 160KB—that's kilobytes—or about one-tenth the capacity you can get on a $1 USB thumb drive today. Cobb said a few of the disks were formatted in DOS, but most of them were from an older operating system called CP/M. CP/M, or Control Program for Microcomputers, was a popular operating system of the 1970s and early 1980s that ultimately lost out to Microsoft's DOS. In the 1970s and 1980s it was the wild west of disk formats and track layouts, Cobb said. The DOS recoveries were easy once a drive was located, but the CP/M disks were far more work. "The older disks, we had to actually figure out how to physically read them," Cobb told PCWorld. "The difficult part was CP/M and the file system itself and how it was written." As the data recovery firm couldn't get Roddenberry's old computer to power on, it had to sleuth the physical layout of the tracks on the disk. That alone took three months to reverse engineer; Cobb credits his own "Scotty," Jim Wilhelmsen, with figuring it out. 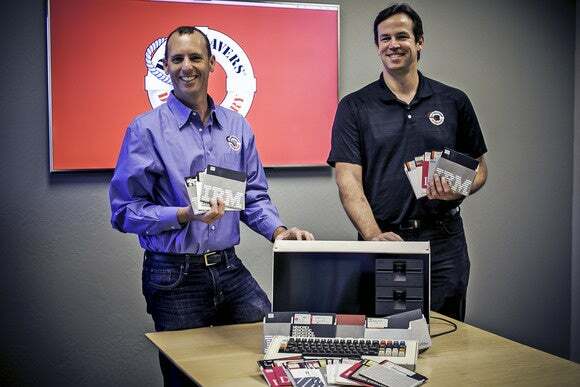 DriveSaver's Mike Cobb and Jim Wilhelmsen with Gene Roddenberry's dead computer and a pile of the floppy disks they helped recover. To make matters worse, about 30 of the disks were damaged, with deep gouges in the magnetic surface. As luck would have it, Cobb said most of the physical damage was over empty portions of the disks and he believes about 95 percent of the data was recovered. Besides seeking the technical expertise required for the task, the estate also wanted high security, according to Cobb. The estate wasn't going to just drop all 200 disks in a FedEx box and pray to the shipping gods they wouldn't get lost. No, only small batches of the disks were doled out at a time, and each batch was hand-delivered to DriveSavers' secure facility in Novato beginning in 2012. Once DriveSavers had recovered the data, the data had to be converted into a format the estate could open. It's not like you can feed a 1980s-era CP/M word processor format into Microsoft Word, so Cobb personally converted each file to a readable text file. All told, Cobb said when the operating system files were excluded, about 2-3MB of data was recovered from the 200 floppies. That may seem like a minuscule amount by today's standards, but in the 1980s, document files were small. Roddenberry's lost words were substantial. So what's actually on the disks? Lost episodes of Star Trek? The secret script for a new show? Or as Popular Science once speculated, a patent for a transporter? Cobb ain't saying. Understandably, when DriverSavers is contracted to recover data, it's also bound by rules of confidentiality. PCWorld reached out to the Roddenberry estate but was told it had no comment on the data or its plans for the newly discovered writing of Gene Roddenberry. For their work in recovering The Great Bird of the Galaxy's lost writing, DriveSavers received a signed photo of the Star Trek creator in front of his computer from his son.